Treaty 8 (1899) and Treaty 11 (1921) are the historic treaties between the Dene and the Government of Canada that covered much of the land that is today’s Northwest Territories. Since the time when these treaties were negotiated and signed there have been problems with the perception of what they really meant. The treaties state the Dene “do hereby cede, release, surrender and yield up to the government of the Dominion of Canada, for His Majesty the King and his Successors forever, all their rights, titles and privileges” to the land and its resources. The Dene claimed the Chiefs, who could not read or write in English, were told at the time of signing that the treaties were simply expressions of friendship and peace, that they were not selling or giving away their land and that their right to hunt and fish would remain “as long as the sun shines and the river flows”. To fight for Dene rights and to regain control over lands they had inhabited for thousands of years the Dene, in 1969, formed an organization called the Indian Brotherhood of the Northwest Territories. In later years this organization was to become known as the Dene Nation. 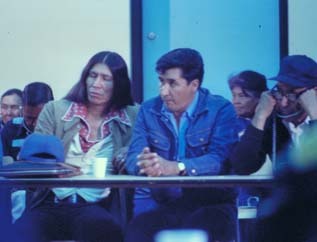 On March 24 th, 1973 sixteen Dene Chiefs, the core of the Indian Brotherhood, attempted to register a caveat – an expression of “Aboriginal Rights” – against the title for more than a million square kilometers of Crown land, almost all of modern day Northwest Territories. The Registrar of Land Titles rejected the caveat because it would have frozen all land transfers and development in the Northwest Territories. The question of the caveat’s legal validity was then referred to the Supreme Court of the Northwest Territories for a ruling. Supreme Court Justice William G. Morrow began hearing the case on May 15 th, 1973. Justice Morrow took a unique approach to hearing testimonies. His court travelled to all communities in the claimed area and heard oral evidence directly from Dene Elders who were present at the signing of Treaty 11 and who remember the treaty-making negotiations. The issue was whether or not the Chiefs who signed Treaties 8 and 11 (or the Dene they represented) knew they were giving up ‘ownership’ of the land. Most witnesses were resolute in saying that during treaty negotiations the issue of land ownership was not raised. Discussions had centred mostly on hunting and fishing rights and how the land and resources would be shared in a peaceful way. The sixteen Chiefs, and the Dene they represented, won their case but the victory, in part, was short lived. Morrow’s decision allowing the placing of a caveat on a million square kilometers of land in the Northwest Territories was overturned on appeal to a higher court. This higher court did not question the ruling that Dene had ‘aboriginal rights’ to the land. This partial victory made it obvious that land rights in the Northwest Territories needed clarification. In 1976 the Government of Canada, the Dene Nation and Métis Association of the Northwest Territories agree to enter into negotiations on a Comprehensive Land Claim Agreement. Seven years of meetings, from 1981 to 1988, resulted in an Agreement in Principle (AIP) that had one major sticking point. The Government of Canada was insisting that the Dene/Métis Comprehensive Land Claim include surrender of Aboriginal Title to the land. Delegates at the 1990 Dene/Métis Annual General Assembly rejected the terms of this agreement. With the breakdown of a single land claim that would have covered all of the Northwest Territories the claim process then became regionalized. Land claim agreements have been reached with the Inuvialuit (1984), Gwich’in (1992), Sahtu Dene/Métis (1994) and the Tlicho (2002). Negotiations are currently underway with the Akaitcho Territory Dene First Nation, the Deh Cho First Nations and the Northwest Territories Métis Nation.